This video is very long at 11 minutes, but less than 1/3 the length of the dog/coyote interaction. It’s not necessary to see it to understand the post. I donned my heavy raincoat and boots and went out to walk my son’s dog and to post some signs as the rain let up a little. When we got to the park, I thought I heard a distressed, loud scream in the far distance. I finished stapling up a sign and then became aware that the screams were occurring at very regular intervals. It had to be a coyote who was upset. As I hurried towards the sound, I passed a dog owner who was calling and searching for her dog who got away. Okay. Now I had the picture. The coyote would be very upset because it was being pursued: Coyotes howl for two reasons in our parks: either they are communicating and responding to sirens, or they are being harassed by a dog. It was a large 70 or so pound pooch who had gone after coyotes before. I ran towards where the sound was coming from and found the dog running and weaving excitedly through a thicket in pursuit of a coyote. I could not help the owner retrieve her dog because of the little dog I had in tow, so I began documenting the upsetting activity. The coyote did a great job of keeping away from the dog with minimal effort, and when she wasn’t actually evading the dog’s advances, she screamed loudly and incisively in regularly spaced spurts — she was piqued. Meanwhile, the owner climbed up and down the hill, over and over again, exhaustively, looking for her dog and calling him repeatedly, but to no avail. The dog would not come. Some onlookers arrived asking what all the noise was about. They, too, attempted calling the dog, enticing him to come with cookies. It didn’t help. The coyote’s intense screams continued over a period of about 20 minutes. She was venting: expressing her anger and displeasure at the dog’s onslaughts. Most urban dogs are wary of this noise — dogs read it as a warning — most will keep away. The dog didn’t seem to approach when the coyote was howling like this. As time wore on, the screams stopped occasionally as the coyote looked intently into the thicket, watching the owner make inroads into the thicket to get her dog. At a certain point, the coyote stopped screaming and looked around, and began sniffing something in the air by putting her nose up high. She seemed relieved, relaxing a little, and hurried off to behind a bush. It was HIM, her mate who had arrived. Her screams must have alerted him — possibly purposefully — to come help — he was now there to aid her. They had work to do. Now they would work as a team to fend off the dog. They proceeded to the edge of the thicket, better prepared for the dog to come after them again. They didn’t have to work hard though, because the large dog was already exhausted and the owner must have been able to grab her dog just about when the two coyotes met. When the coyotes saw the dog leave the area, they ran back and forth with their body’s wagging, wiggling and squiggling. There were body presses and nose rubs and smiles and twists. It was a more exuberant form of their routine evening greeting. I almost read these as a victory celebration. We next saw the owner and her leashed dog walking on a path in the distance. About 100 feet behind them, on the same trail, were the two coyotes, making sure that that particular dog left the park — escorting them out. The coyotes watched the duo exit the park and then the male went back into the bushes. But the female lay down right in the middle of the path. She, too, was probably worn out from the harrowing experience. No other people except me and my dog were to be seen in the park — it was very quiet. As she lay there, I noticed that she kept her eye on something off the path up ahead. I went to investigate what it was, and as I did so, I heard sobbing. It was a young woman, sitting in the grass in the rain under a large black umbrella, crying. I asked her if she was okay, or if I could help with anything. She told me that she was just having a very hard day. A man and his dog then came walking down the path towards us. I called out to him that the coyote was there, and he leashed his dog. I told him about the upsetting coyote activity — that was why the coyote was lying there — and about the young woman who was having a hard day. He said, “Man, it’s just a stormy Monday”. He was about to turn to go the other way so as not to disturb the coyote, but the coyote got up, stretched, turned around and wandered down the path out of the area. So, the man continued his walk and I, too, left the area with little dog in tow. In the video you can hear the raindrops hit the plastic I use as a raincoat for the camera. Yes, it was a stormy Monday. About four years ago the pair of coyotes I watched for several years were supplanted by their daughter Mary when she pledged herself to an older scallywag male coyote that I named Rufous. The new couple kept different hours than the ousted Mom and Dad coyote I had been watching. Recently I saw coyotes in the same place as before. Now I am trying to get their story. I suspect that the two coyotes pictured together are mother and child. I assume the mother is the one looking into the camera and I suspect she is the mother because she looks like she is showing, this being the time of year where she would be showing. The protector coyote is a male and there is no reason yet to be sure that he is the presumed mother’s mate as opposed to being her son. Likewise, the presumed mother’s stare reminds me of Mary’s, but I can’t yet be sure that it is her. I wish Rufous would have showed up to do the protecting. But I haven’t seen him. Had he shown up I would have recognized him because he is a big handsome fellow and four years ago he looked like he had a blind left eye. It may be wishful thinking on my part, but the protector coyote has a reddish coloring and Rufous was a markedly reddish coyote. I know there is a fourth coyote among these three, and there may be more than four. Also, the protector coyote has eyes that remind me of Mom coyote from 4 years ago. The showing female has a harsh stare. The protector coyote, like Mom, has something tentative in his expression. Yet despite Mom’s shyness, like today’s protector male, both get the job done in good form. The job is to make their claim to the territory known and to nudge Holtz and me away. We did leave, very slowly because Holtz is now about 15 and wobbles when he walks. Posting written by Charles Wood. 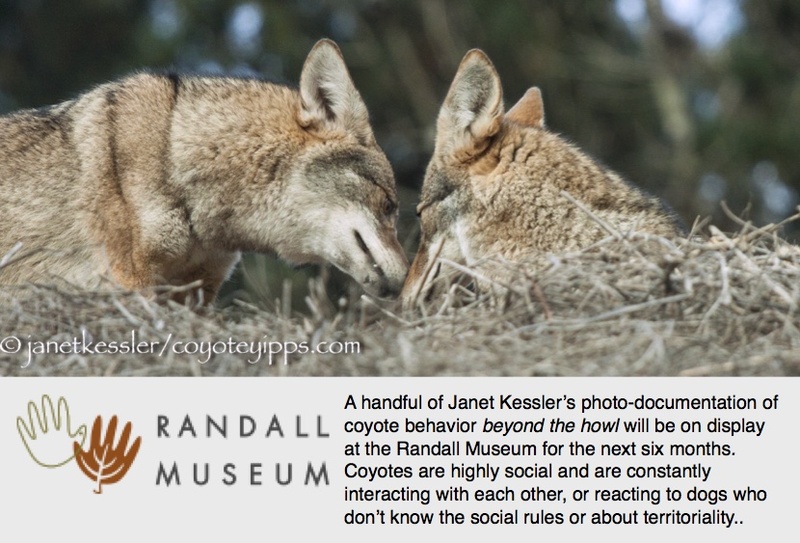 Visit Charles Wood’s website for more coyote photos from LA: Charles Wood. His work is copyrighted and may only be used with his explicit permission. Rat poison kills by use of the ingredient warfarin, or a second generation thereof, which thins the blood. In small doses, humans take a similar drug known as cumaden to prevent strokes. In high doses, these kill by causing the organism to bleed internally — massively. It’s a horrible, tortuous death. It should not be allowed. Rats can be eliminated in a more humane manner if need be. Very small doses of rat poison may not immediately kill the owl, hawk, or coyote that consumes the poisoned rat, but the effects are just as insidious over a longer period of time. The poison accumulates and compromises the ability to live in various ways, most notably by slowing them down. They are not as alert or as fast or as acute as they once were, so living becomes more difficult and even dangerous for them. One of the effects of rat poisons on coyotes is that it compromises their immune systems, leaving them particularly vulnerable to parasites, including mites of all types. The worst, of course, is mange. Rat poison doesn’t cause mange, of course, but it can be a highly contributive factor because it weakens the immune system which fights off these mites. If you see a coyote whose fur is riddled with mites, or who has mange, it may very well be rat poison which allowed the mite infestation to take hold. Please don’t use rat poison. Also, please try and help any animal that has an ailment — they can be helped by calling your wildlife rehabilitation agency. Rats can be eliminated in a humane way. The best way is by exclusion and removing the attractants: plug up the holes in your home and remove/contain food sources. Within two weeks, they’ll leave. Alternatively, there are high-frequency devices which drive the animals away (but probably also the birds). Lastly, you can call a pest-removal service that uses humane traps. Please note that most private pest-management companies will either drown the rat or suffocate it to death with industrial strength carbon dioxide – both methods are extremely painful. The animal needs to be killed humanely. To find a trapper in your area, please Google “humane trapper”. For rodent control alternatives, please visit www.wildcarebayarea.org/rodenticide or www.wildlife.ca.gov/Living-with-Wildlife/Rodenticides. My friend found her, having been led there by her dog, CC, who is an incredibly inquisitive, active explorer, even on-leash. And my friend lets her dog lead the way. This time she was lead to where a dead coyote lay hidden in the bushes. My friend knew it was a canid, but when she wrote me about it, she referred to it as a *creature*, knowing that a coyote death would upset me, especially where I knew all the coyotes. She told me its general location and sent me a photo showing tree branches. I was able to find the coyote because of the photo. The type of tree under which the coyote lay would be found only in a certain area. That is the area I searched until I found the critter. I was crushed when I first saw it. It was a young coyote with very ruffled and light colored fur — I’ve seen yearlings with this coloring. This coyote must have recently dispersed from another area, because she was not from the territory in which she had been found. I know those coyotes well, and this one was not one of them, and I had not seen her ever before. She was wedged in there, held in by a broken branch poking into her neck. It was a tangle of branches, and I had to bend over, and go over and under, being careful to avoid getting branches in my face. I wondered if this animal might have become trapped there, but I was able to move this branch without too much effort, so probably not. On the other side of the tree limb which she was under, her face could be seen with the eye facing up being opened. It was a gorgeous blue. Young coyotes often have blue eyes. Most coyotes in cities are killed by cars, but this coyote was found right in the middle of a park, past the backyards of a row of houses, not close to any streets, so she probably would not have been hit by a car. I didn’t see any trauma to her body. What to do? I thought about it only a moment and decided on a necropsy. Those on the sidewalk watching me were very happy about this decision. We all wanted to know what had killed this coyote. I walked to a store which was only 2 minutes away to get 55 gallon bags. I was able to bag the coyote by pushing it into the large bag with another smaller plastic bag over my hand. A man who was there offered to carry it to the car. This young coyote must have weighed a mere 25 pounds at most. I got home and called Wildcare, and after some back and forth conversation, my husband drove me up to San Rafael where Wildcare is located. Initially they did an X-ray which showed a VERY full stomach. But there was no trauma to the body — no broken bones or ribs. What could have killed her? Several weeks later, I was called with the results of the necropsy report: She had died of massive internal bleeding due to rat poisoning. There were actually four different types of rat poisons found in her liver, with the highest poison concentration being Bromadiolone, so she had eaten bad rats from at least four sources, and she may have eaten the poison pellets herself. Each brand of rat poison only carries ONE of the poisons. Different people buy different brands. This shows that many people in the area are using rat poisons. Wildcare is finding rat poison in most of the animals it treats — isn’t this incredible? I’ll be working with Wildcare to help get information out about poisons — and hopefully folks will become aware of the harm poisons cause to our wildlife, and hopefully they’ll stop using them. PLEASE TALK TO YOUR NEIGHBORS, FRIENDS AND COLLEAGUES AND ASK THEM NEVER TO USE RAT POISON — EVER! This branch is definitely in the way so it’ll have to go.